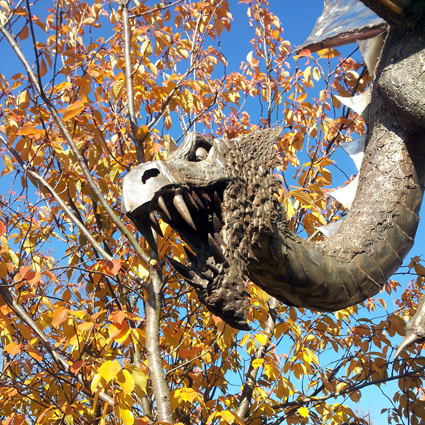 This great photo was taken by Pogodragon who, as her name suggests, rather likes dragons. She is also a pretty good photographer. The picture shows a wonderful statue of a dragon on the corner of Manvers Street in Sneinton, Nottingham, but I have to say it looks like it could come alive to bite passers-by at any second! The photo is copyright Pogodragon and is used with permission. Please do not download it or copy it without permission. I've taken the word verification off. The reason I added it was that I was getting a lot of really annoying spam. Let's see how it fares this time. His 'brother' is in the garden of a house a couple of miles away, I assume that's where the artist lives. Really rather splendid though, both of them. I knew if I stopped in, I'd find something good to read. By the by, you're among my picks for the Witchy Blog Awards.